The screenshots below show simple yet powerful pixel analyses using tools in Mira Pro x64 and Mira MX x64. 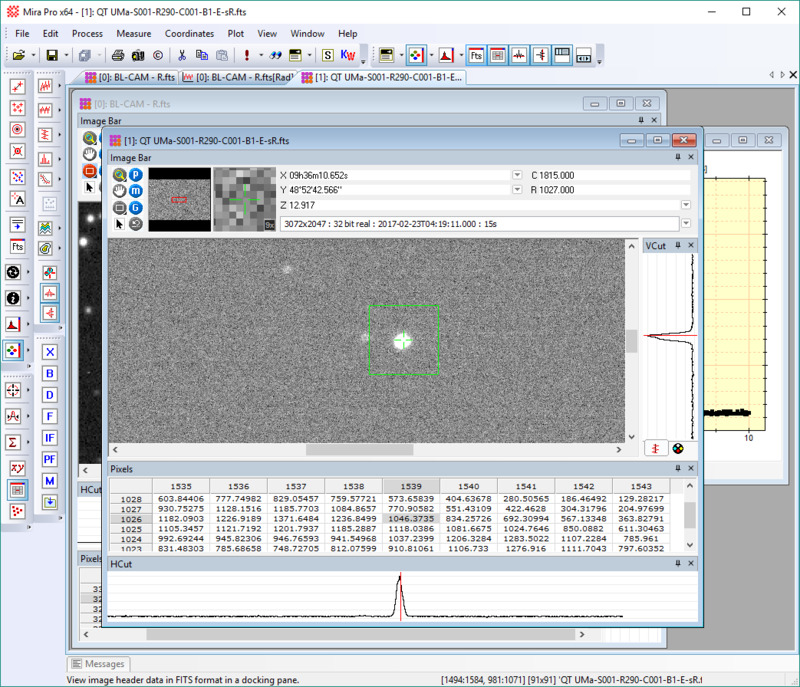 Several live analysis tools work using docking panes to provide a quick, simultaneous, dynamic views of pixel data, including image and world coordinates, central pixel value, a table of regional values, and line plots in horizontal and vertical directions. 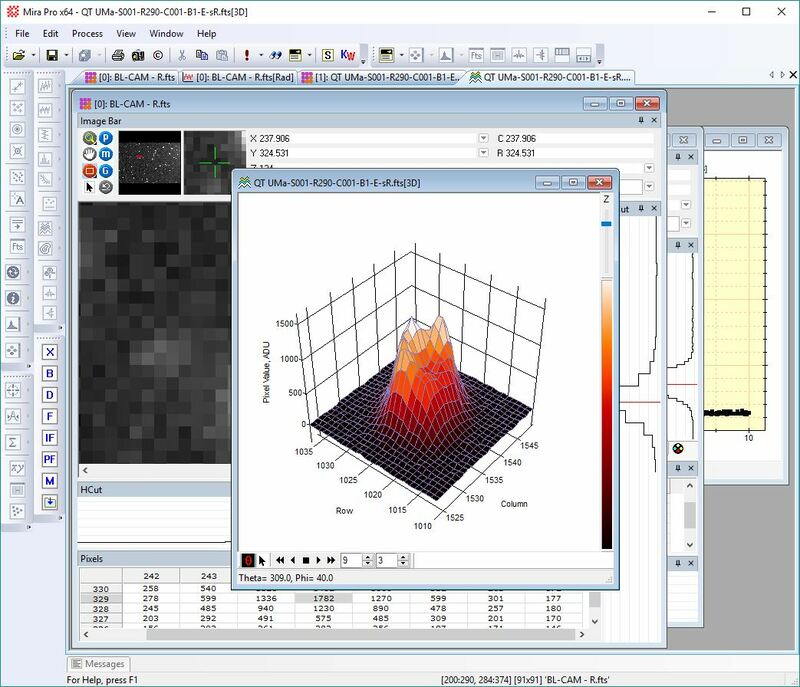 Of course, Mira the various platforms offer several other tools for interrogating pixels, such as contour plots, 3-D surface plots, line plots, histograms, point measurements, etc. Coordinate readout occurs in the Image Bar at top, itself a docking pane. One outstanding aspect of this combination of live tools is that all are tied to Mira's Image Cursor. In Image Cursor Mode, Mira dynamically updates all live tools in sync with the image cursor position and size, yet the Image Cursor stays where you drop it or precisely move it using arrow keys, thus preventing the live tool sync from being lost if operated by a live GUI pointer. In the screenshots below, the image cursor is green and set to the rectangle shape. Mira is very efficient, so all update at full speed as the image cursor is moved, or the image is zoomed or panned. The individual tool panes may be displayed or hidden using buttons on the Image Pane toolbar at the top of the Mira screen. The left screenshot below shows the image at 1x zoom with the transfer function scaled to the entire image. Although the star profile is saturated in the image view, the intensity slices show an asymmetry in the point spread function. 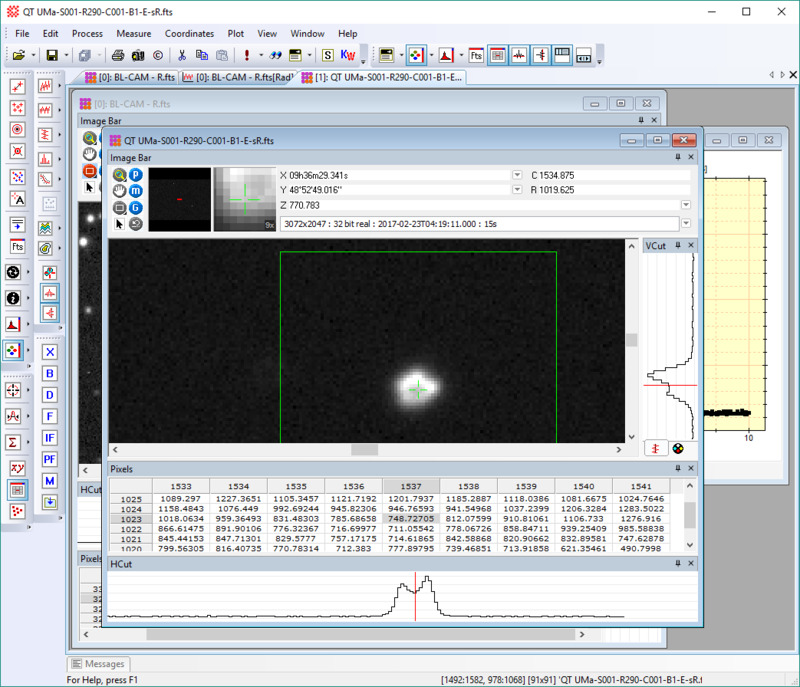 The middle screenshot shows the image zoomed to show detail on the point profile and with the transfer function changed to emphasize pixels inside the green image cursor. Notice the blobs and a central hole showing at least an issue with the image focus. At right is a 3-D surface plot showing a clearly defocused image. (Click the thumbnails to open full-size images in another tab).